The popularity met by the "Made in Italy", above all in super yacht's field, in the last years has undoubtedly changed all Italian shipyards' features. Many realities have been developed into structures right made for better facing up either to fighting tech - styling competition even able to improve the quality of the yachts manufactured, or to the market expansion becoming on a great deal of opinion a real global matter now. All this has led to set up production ventures too consisting of many per sè strong brands that thanks to aimed acquisitions are flown together into. They are actually trade marks greatly appealing to customers, whose production has been so impressively improved by these newcomers that it is able to change all their craft manlike realizing features into industrial ones and to build a lot of series hulls. This rule applies to Fipa Group, grounded about twenty five years ago by Francesco Guidetti, only in part. His offer including such trade marks as Maiora, AB Yachts e C.B.I. Navi, acquired only a few months ago, provides a production not to be considered as a big series one, since it actually turns to specific market niches; his hull typology represents per sè exclusivity, either from technology - this is the case of Open AB Yachts - or layouts and comfort point of view since they are finely recognisable in the "Made in Italy". In our effort of better understanding which strategies have actually led Fipa Group to control C.B.I. Navi and how does this Group from Viareggio develop in future, we seemed to be obliged to go and interview Francesco Guidetti met at the yard in Massarosa, the historical Maiora's headquarters. How was it born? Was it such an opportunity to grasp or did it come from an exact strategy made for increasing the group? Well, we have chosen to acquire C.B.I. Navi in effort on both taking advantages of producing metal crafts up to 60 metres in the inner waters of the Port of Livorno, and putting a complete range of offers on the market. This new segment as well as other brands run by Fipa Group's societies, right situated in the Port of Viareggio, let us supply our present and future customers with all - round care services for yachts of 20 to 60m. Which kind of reality did you find in C.B.I. Navi? Well, CBI Navi is actually a yard working in the Viareggio area since a very long time indeed - grounded around 1984 - and passed from one owner to the other and from one management to the other. In the past it realized different sized yachts in metal until in 2004 it built a 52 - metre ship. Till now the yard counts roughly 30 yachts already produced. To what kind of customers do C.B.I. Navi's yachts turn to? Are they in some way similar to Maiora's ones? What is actually changed or what will change in future by the new ownership? A typical C.B.I. Navi customer is an owner who brings his designer with, seeking so only for a building yard. Since I think on board a big yacht, more than on a smaller one, it expects to let the owner realize all his wishes, we have re - qualified all production tech - managers so as to enable them for better building CBI's yachts and raising all yard's products to top - quality standards. How are you actually organizing your group for running this new brand? Well, we are actually working at enabling the marketing office to care all Fipa Group's products; however, every mark refers to the marketing manager of the building yard. Did you yet sell CBI Navi's yachts or crafts under construction now only refer to orders received under the last running? At C.B.I. Navi there is a 38 - metre yacht still under construction now due for completion 2006. We are just drawn some projects and in the next month we will be planning the building of two yachts, 55 - metres and a 37 - metres respectively. When will we see the first C.B.I. Navi's yacht, fully designed and built by Fipa Group? Well, the first unit of them will be delivered on spring 2007. Broadly speaking of Open, how does AB Yachts' range develop in future? After the 88 will also greater yachts be built, or not? Valuing the orders we are receiving now, we have to take into account that the market asks for bigger and bigger dimensions today; this is the reason why we are right designing and building at AB Yachts a 40 - metre yacht provided by Hard Top that will maintain all distinctive AB Yachts production features performing waterjet propulsion and speed of 45 knots on. Concerning Maiora which are middle - and long - time news? In 2004 Maiora's production was enriched of the new Maiora 27 and Maiora 38 featuring planing bottom and speed over 31 knots. In July we delivered the new displacing Maiora 43 to the owner. 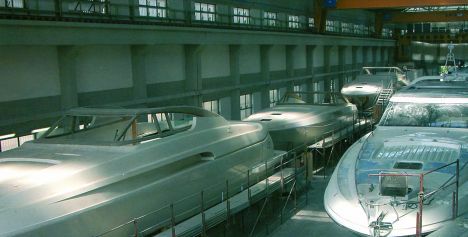 Moreover, at our yard there are a new series of fibre glass half - planing 45 - metre yachts, but for the first unity it's to be waited a little bit more: her launch is set for spring 2008. Is the season of acquisitions already come to an and or do you foresee Fipa Group expanding in any way? Anyway, I don't like to set limits to speaking of "ended acquisitions" but I think Fipa Group already gives sea lovers a lot of offers with its complete and differentiating production.